In the Army, ships need to be unloaded quickly and expertly. Join us as a Port Operator and we’ll teach you how. You’ll learn how to use specialist machinery like cranes, and how to drive different kinds of vehicles. Plus, you can take qualifications including an apprenticeship, advanced driving licences and recognised trade qualifications – great for your career. You will travel the world in support of operations and disaster relief tasks and you will serve alongside the Royal Marines and Airborne Forces too. On top of that, you’ll make lifelong friends, play sports and try Adventurous Training. Work out of the military port in Marchwood (Southampton). Learn how to load and unload vessels to meet port deadlines and operational commitments. Travel worldwide, wherever military vessels go, loading and unloading as part of a Port Task Group. Work in support of Royal Marines, Airborne Forces and multinational organisations. 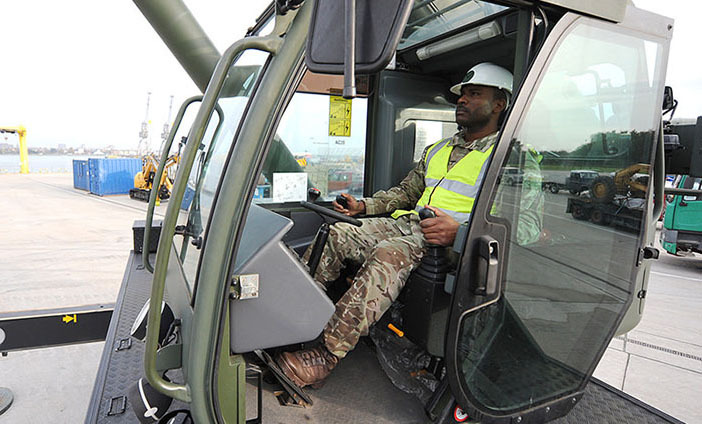 Gain multiple vehicle licences and a vast array of civilian qualifications. You start by learning to be a soldier with your Reserve unit. Training lasts at least 23 days and teaches you how to handle weapons and survive outside.